To replace the climate control air filter, refer to the page 6-16.
o Replace the filter every 10,000 miles (15,000 km) or once a year. If the car is being driven in severe conditions such as dusty, rough roads, more frequent climate control air filter inspections and changes are required. 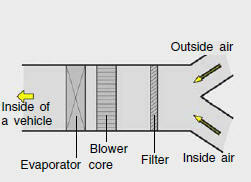 o When the air flow rate is decreased, the system should be checked at an authorized dealer.